Few dishes embody Pak Tai or the southern region of Thailand as fully as khao yam or spicy rice salad. A bewitching, yet surprising mix of herbs, vegetables, seafood, and rice, khao yam is one of those dishes that manages to retain a “cool factor”. Khao yam is said to have been created when the ruler of a southern Thai region asked a doctor to create a dish that would combine all of the healthy ingredients available at the time onto one plate. The doctor came up with this rice salad, making sure to include Indian mulberry, a tree that grew close to the houses of well-respected people in the community. More likely khao yam’s ties originate from the Malay culinary tradition, since Thailand’s three southernmost provinces — Pattani, Narathiwat and Yala — once formed part of the Sultanate of Pattani, which included what is now Kelantan in Northeastern Malaysia. One of the reasons this rice salad can be challenging to replicate is because it boasts a mind-boggling array of ingredients, many found solely in the region. 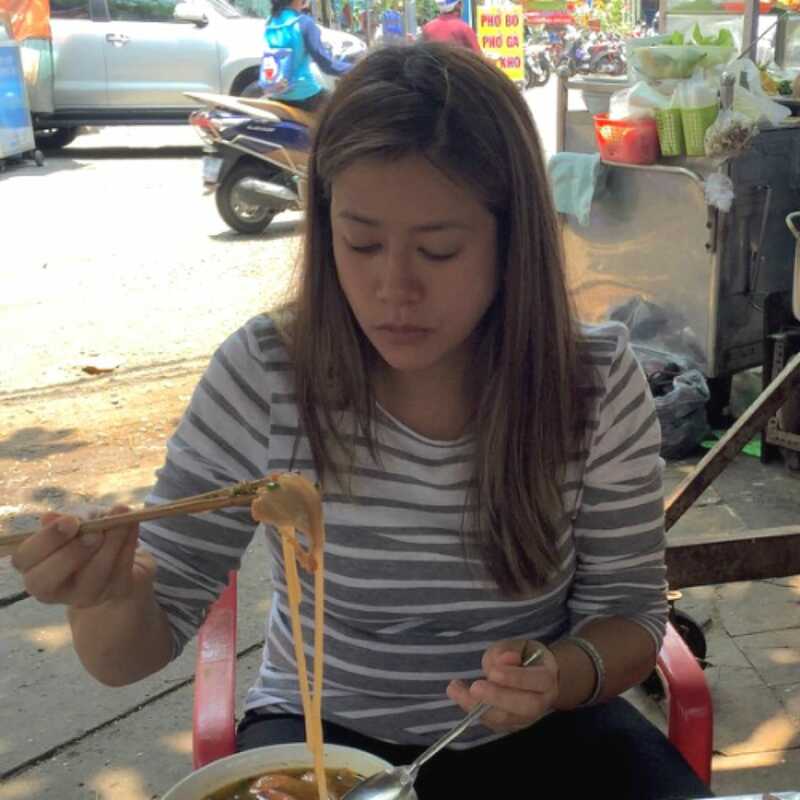 However, Thai cooks say that khao yam — like many other dishes from Thailand — is a dish that can be made with any ingredients that are on hand, provided that they are fresh and fit into the dish’s tart, salty, and herbal profile. For Chin, the khao yam ingredients that she uses are chosen in part for their texture and smell. Besides items like sour mango, carrot, pomelo, long bean, kaffir lime leaf, lemongrass, ground dried shrimp, and ground roasted coconut, Chin also typically includes bai chaplu (bitter leaf), chamuk plarot (rosy milkweed), sesame seeds, ground white almond and both banana and bird’s eye chilies. Even the rice is not plain jasmine rice, but colored with butterfly pea blossom and gardenia fruit to make the grains purple and yellow, respectively. All the ingredients, she says, are selected with a purpose in mind, be they to encourage you to eat more (the chilis), to make you feel full (the ground almond) or just to simply make it pretty (the butterfly pea and gardenia). At the same time, the addition of Southern ingredients such as bai yor (Indian mulberry) and moringa flower are also meant to provide immunity-boosting antioxidants, boost circulation and help fight cancer, according to old medical lore. One important ingredient remains the main component of the salad dressing: nam budu, or the liquid from pickled fish mixed with salt. Similar in composition to the pla rah (fermented Thai anchovy) of the Northeast, the juice of pulverized field crabs in the North (nam poo), and the Central region’s shrimp paste (gapi), nam budu is used as a base in many Southern Thai dishes, grounding them in the earthy, deep flavors for which the area has become known. If all of this sounds labor-intensive, that’s because it is. But khao yam is a dish that inspires devotion nonetheless. “It’s the only dish I bother to cook,” said artist and floral designer Nuraya Mahani, who hails from Pattani. 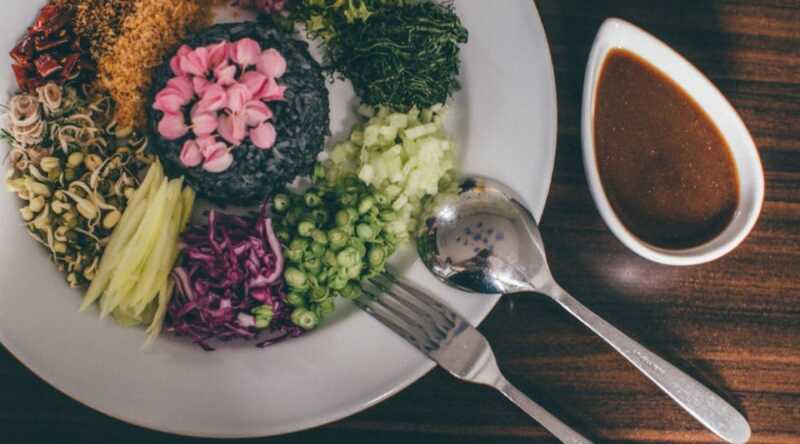 Her rice salad recipe bears flourishes special to her hometown: minced fresh shrimp; a yeera blossom, which resembles a protea flower; small fresh Thai mackerel stir-fried with lemongrass; and rice mixed with pulverized bai yaw (noni leaves) to make it fragrant. But Chin says other variations exist which differ from the nam budu-based far South standard. In Nakhon Si Thammarat, the dressing is built on a curry paste (krueng gaeng) of lemongrass, kaffir lime skin, tumeric, galangal and chilis which is then stir-fried with coconut milk and added to the rice. 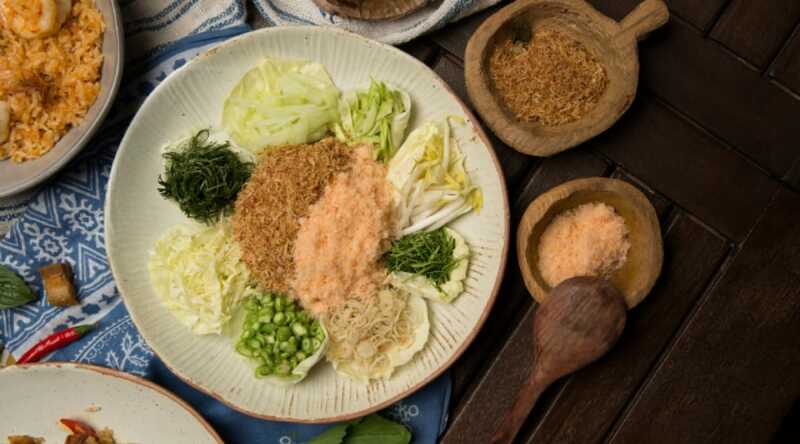 In Phang Nga, Chumphon and Ranong, the salad is eaten with pickled vegetables like papaya and carrot and utilizes nam koei, a liquid derived from shrimp paste. Whichever version you prefer, there are numerous restaurants in Bangkok at which you can sample this dish including Bib Gourmand restaurants The Local, Prai Raya and Khua Kling Pak Sod. Several vendors at the Ramkhamhaeng University Night Market will also compose the dish to order from an array of ingredients spread out on their table. As condos and mega-malls pop up like daisies, colonial-style buildings, like the one that houses this authentic Thai restaurant, become harder to find. Private dining rooms are dripping with Old World charm and antique décor while the main restaurant, Viva Room, has thick wicker chairs and artful murals. Dishes are crafted from secret family recipes and represent all regions of Thailand. Service is warm and friendly. After winning the favour of locals in Phuket, residents of the capital are equally starry-eyed for Prai Raya's Southern-style cuisine. The signature dish is the yellow curry noodle dish with large chunks of fresh crabmeat served with coconut milk. To ensure freshness, ingredients like crab, vegetables, and shrimp are brought in weekly from Phuket. Dine indoors in a relaxing atmosphere or al fresco in the charming garden that makes you forget you're in a city. The family that runs this casual restaurant brought their beloved aunt's homemade recipes from Chumporn in southern Thailand to Bangkok to much fanfare. Dishes are unapologetically spicy; just how good southern Thai food should be. Recommended dishes are the fiery kua kling pak sod (dry curry with minced pork), staw pad kapi koong (stir-fried stink bean with pork), and moo hong (stewed pork in sweet sauce). An ideal spot for a casual meal with spice-loving friends.